We have altered plans to stay in Ladakh until the 2nd of August.?? We originally planned to head south and visit Kerala before heading to CRHP to volunteer, but with Amanda not feeling well we have not really had a chance to explore the mountains of Ladakh.?? Now that she is feeling better we are planning a 6 or 7 day trekking adventure and to visit some local temples with Anne-cecile, and Gael, some friends from Navdanya. It really would be a shame to come all this way and not see more.?? While Amanda was recuperating in our great room at the guesthouse I was lucky enough to make it to a Buddhist festival in a small town near by.?? The costumes and dance were great but there were more tourist with cameras there than locals, so I took a stroll through the town with Yuka, a friend I met on the bus.?? 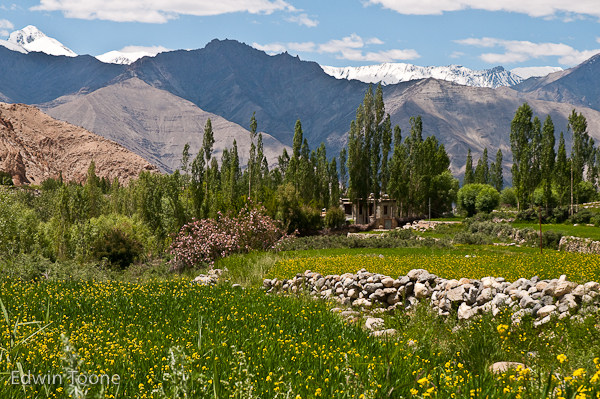 The town was a small green oasis surrounded by tall dry mountains like much of Ladakh but impressive none the less.??? ?